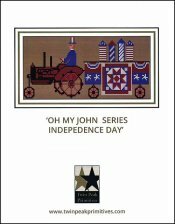 Oh My John Series: Independence Day [H5452] - $13.00 : Yarn Tree, Your wholesale source for cross stitch supplies. Cross stitch pattern by Twin Peak Primitives. Let freedom ring! Wearing a red, white & blue top hat, a gentleman is driving the tractor in the Fourth of July parade. The wagon that is being pulled is all decorated for the festivities! Happy 4th of July! Stitch count is 135W x 58H. Stitched on #7548 Zweigart Aida 14ct. Dirty.